"They built me my dream car! Top quality work and an honest caring bunch of car nuts is what you will find at V8 Speed & Resto. This shop has what it takes to build whatever you can think of and do it right. Thanks again for building my 1969 Firebird project named Routy. It exceeded my expectations… and that's hard to do." Small town shop with world class results! V8 Speed & Resto is headed up by front man and founder Kevin Oeste a true Visionary with a deep understanding of what’s the best fit for performance & function, classic or cruiser and an incredible knowledge base to back it all up. His ability to think outside the box to make your project truly one of a kind is in his wheelhouse. The shop manager is Kelle Oeste She definitely is no stranger around an engine bay and just one of those people that “gets it” and is remarkable at keeping all daily aspects in the shop finely tuned. The V8 Crew is unsurpassed for making your Muscle Car vision come to life --- they provide the perfect complement of performance and style to fit your Dream muscle car specifications. The Crew's commitment to producing a Quality product stems from the top management with the greatest attention to the slightest of details which makes the experience memorable & top notch .A feature which makes this group stand above others in the same business is the documentation process, everything from start to finish is documented and walked through just as though you were there and asking the important questions “why would we do that and use this part….well they will tell you why”. 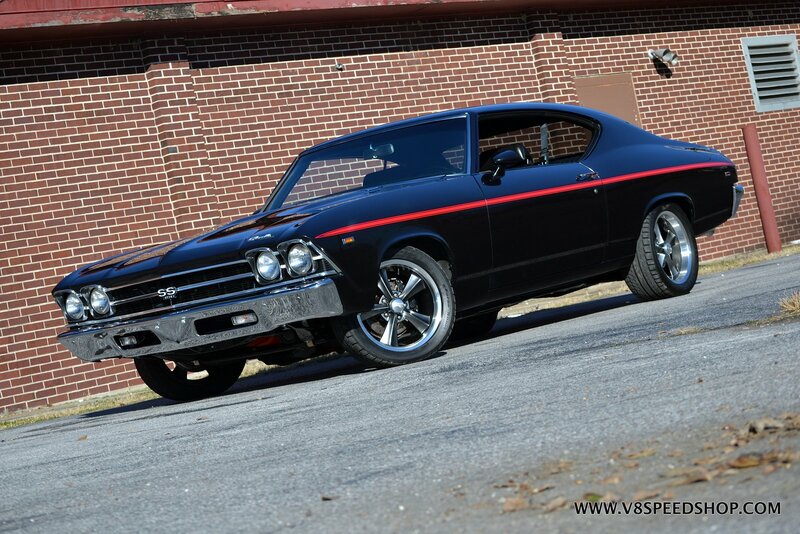 See for yourself…….My car truly is a Star featured under Project cars on the V8TVshow.com website “1965 Chevelle SS”. It is a Daily Driver too. “World Of Wheels” Show winner story. Just got a chance to see the video of the car. As always excellent job. I really appreciate all the work everyone at V8 Speed & Resto did on my car. It was a pleasure to work with you. Your shop sets the standards that others should follow. If you ever need anything from me don't hesitate to ask. There's always a cold one waiting if you are in the area. I just got the gift from you guys. Actually teared Up a little. The positive energy and warmth from You and your team has made my day since we have met. I am so glad to know all of you. I have "close friends" that have been absent throughout this process and you guys are always there. Thank u all so much. I can't wait to thank everyone in person and extend my very heartfelt sincere thanks. This Hot Wheels is one of my all time favorites. This one Is in AMAZING shape. So awesome. I actually still collect and have the supplies to set up my very own Hot Wheels Restoration shop. My employees and I have Hot Wheels drag races as well. Thanks so much. I love u guys. Have an amazing weekend!!! Huge thank you to the crew at V8 Speed and Custom shop in Red Bud. I had them rebuild the carb, replace the front end, do some custom exhaust work to get the pipes off the ground (they were way low! ), and fix my stuck passenger door. They were amazing to work with, keeping me updated on a daily basis, and I'm happy to say the car performs 100 times better!!!! A joy to drive! V8 Speed and Resto does awesome work! 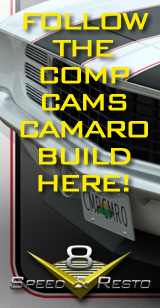 They can build the car of your dreams! They just completed setting the ride height on the recently installed DSE suspension. Looking Killer! Thought you'd like to see the fuel rail covers with 442 emblems. The drivers fit perfectly. Passenger side need trimming around a/c compressor. You can't really tell though. The car is a big hit with all who see it. Even my friends that thought I was totally screwing up my "original" 442. Everyone gets it now. And they all want to know where I had the work done. V8 Speed and Resto in Red Bud, Illinois. Where else! I want to thank you and the team at V8 for the outstanding work performed on my Duster. I was so excited to get it back that I drove it approximately 1,000 miles before putting it away for winter. Got the 'Cuda back today from the restoration shop V8 Speed Shop in RedBud IL. It took longer than expected because there was more to be done than expected, so it cost more than expected. The engine bay looks fantastic, and she is sound as a dollar!" Everything is running great. I meant to reach out to you earlier to let you and the guys know that I drove 775 miles that first day without any issues. It's a true testament of the quality of work that was done to it. "I continue to be impressed with your operation and the talent of your people. The expertise with the wood restoration and metal work is fascinating. Rod's great to work with and never seems to be too busy to answer questions and to show me what's going on." "The shop tour video Kevin did was excellent. I really enjoyed it. I have forwarded it to many of my friends. I also found the photo gallery for the '46. I have enjoyed going thru the pictures and watching the process of making my car beautiful. I am so glad I went with the Mercedes Benz Steel Grey instead of the original color I had in mind. The paint looks great on the car. Friends I have shared pictures with say it looks fantastic. Thank the crew for the hard work they have done to make the car beautiful"
"Hey Kelle !! Made it home without a tow truck 😂😂😂. Runs like a top . Air is nice and cool too. Thanks again to Mike and all involved on turning the Olds into Mr. Fancy Pants. Really looks nice. 😎😎 . Ray"
"Kelle the car ran great!! I think it’s ready to enjoy again. Thanks to you and your crew! See you at the Drive In!" B. B. "Thank for checking in Kelle. Runs great. Handles WAY better. Much more enjoyable and comfortable to drive. In fact I had it out yesterday. Thank you also for efforts and complimentary labor time to make the steering better. I have driven the car more in the last couple weeks than in the last 5 yrs. Larry"
"Amazing things happen when passion and career meet. These people are incredibly talented." S.J. "I would like to thank Kelle, Kevin, and the whole crew at V 8 Speed and Resto. 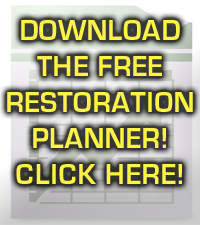 You could not ask for better folks to deal with on anything your classic car needs. 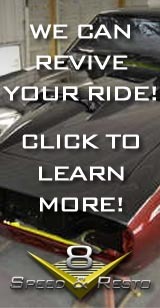 Check them out, you won't be disappointed...." J. L.
"The crew at this speed and resto shop is top notch! Great people to work with. I don't own a show car, but I own an older corvette that I really enjoy driving. I bought it with several known issues and let Kevin and his crew tackle a lot of them recently. I can't believe the difference! They kept me posted through out the process, including picture and video updates! I couldn't be happier with the results and the experience. As time and $$$ permit, I will be back!!! Thank you to all who took part!" P.A. "Kevin, Kelle, and the entire crew at V8TV are top notch, down to earth kind of people. The work coming out of their ship is second to none. Don't forget about the web series 'Muscle Car of the Week'. It's a must see." M.C. "They do nice work. I've seen a lot of the work they have done and were very impressed" F. S.
"The only shop I've ever been in that does everything the correct way" B. Z. "The highest standards of quality and workmanship. Highly recommend" C. D.
"Kevin - thanks again for the tour. The shop, your staff and the cars are incredible!!" "I finally had the chance to drive the Mustang last weekend, Kevin! Completely different ride my friend. Not quite sure how to thank you and the crew for making it complete again." - S.M. "My old man hasn’t been happier! You guys did an awesome job." - C.S. "Kev, Kelle....you guys were worth the 10 hour drive (both ways). Best decision I ever made to bring it to you. If I should ever fall backwards into money again I will definitely be bringing it back for more modifications that are beyond my abilities. LOL!! For the rest of you....stop waiting, they are TOP NOTCH!!!" T. R.